Compare Juice Soda Pop Milk Tests the Differences Between Drinks. 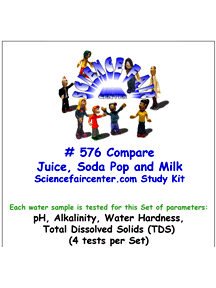 Compare Juice Soda Pop Milk Tests, Compare the differences between drinks. Experiment for a first time science fair project. Testing only takes a few minutes per sample. Each water sample is tested for this Set of parameters: pH, Alkalinity, Water Hardness, Total Dissolved Solids (TDS) (4 tests per set).